On Monday, Dec. 3, 2007, at 04:16 hours, East Allen Twp. Station 46 and Allen Twp. Station 45 were dispatched to a dwelling fire on Franks Drive in Spring Lake Village East Allen Township, just west of Airport Road. Upon arrival Chief 4651 confirmed a working attic fire and requested a full response from Bath Station 40. Engine 4611 arrived and 1-1 3/4" hand line was used to attack the fire. Ladder 4621 vented the roof. Most of the fire was knocked down quickly, however, numerous hotspots required the pulling of ceilings and extensive overhaul. Additional manpower was requested from Hanover Township Station 15 and Northampton Station 42. On Saturday, Dec. 1, 2007, East Allen Township held its first annual 'Christmas in the Park' at Bicentennial Park West. Numerous activities and events were enjoyed by all, including Santa arriving on Ladder 4621. See Photos. On Sunday, Oct. 14, 2007, EAFD took our Fire Prevention Week show on the road to the children in Sunday School at St. Peters United Church of Christ. In spite of the cool weather everyone seemed to enjoy the outdoor activities, including the firefighters. On Friday, Oct. 12, 2007, EAFD provided a morning of Fire Prevention and Fun for about 32 youngsters and about a-dozen-and-half parents and teachers from St. John's Nursery School. The kids learned about Fire Prevention Week, how to evacuate, what to do in smoke and if clothing catches fire, and fire safety with Bert and Ernie. On Tuesday, Oct. 9, 2007, a group of youngsters, parents and teachers from The Wonder Kids Day Care Center visited the fire station. They heard about fire safety, got to see a firefighter in full firefighting regalia, toured the station, saw fire trucks, and got to squirt water from a real fire hose. The weather was hot so no one minded the water games. 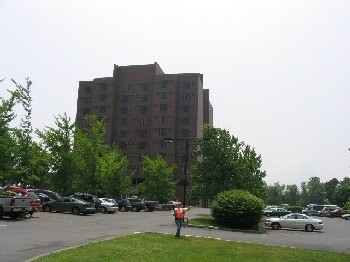 On Monday, Sept. 17, 2007, Dispatched for Motor Vehicle Accident on Nor-Bath Blvd. On arrival (4691) advised units that there was one patient entrapped in the car. Rescue 4641 and Engine 4611 responded to on scene. Engine 4611 crews stretched a 1¾ inch hand line to protect the rescues and patient. Rescue 4641 crew used the Hurst spreaders to free the patient. The units cleared the scene within 45 minutes. For the past month we have been working to improve the area directly in front of our apparatus bays. The macadam was showing its age and was beginning to fail under the weight of apparatus when parked for periods of time. Much of the labor and material were donated. 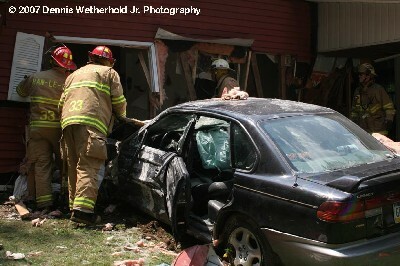 Car plunges into house with collapse and entrapment! On Saturday, May 12, a new trailer was received to replace the 1986 Mack Haz-Mat Truck. The unit is currently being outfitted with shelving and other components prior to being placed into service. MVA at Airport Road and Nor-Bath Blvd. On Tuesday, May 1, upon arrival found three-vehicle accident. One vehicle on the northwest corner on the grass and the other vehicle on Airport Road north of Nor-Bath Blvd. A third vehicle involved was parked in the lot of Barnhouse Restaurant. EMS 4672 took EMS command. Fire personnel stabilized vehicle 1 and vehicle 2. Also provided spill control and traffic control. On Saturday, April 28, members of EAFD, said good-bye to Brush 4642, a 1989 GMC after 18 years of service. Later this year we will be taking delivery of a replacement unit. On Saturday, April 21 - Dispatched for a Mountain Fire with Lehigh County Station 24. The request came thru Lehigh Township Chief 4751. Responded with 4647, 4645, Township Pubic Works Truck, Chief 4651 and his ATV and trailer. A five man crew went to the east end of the fire and proceeded up the mountain. 4651 and 4652 both on ATVs proceeded to the west end of the fire to transport equipment and personnel into the fire area. 4751 ordered that all crews be removed from the mountain before nightfall. All 46 crew members rehabbed and accounted for. Released by 47 command. On Saturday, April 14 - Dispatched for diesel fuel spill at Chrisphalt Dr. and PA 512. On arrival (4651) found a semi trailer disconnected from the tractor. The trailer was a refrigeration unit and it had a 50 gallon diesel tank under the trailer. This tank as a result of the trailer disconnecting from the tractor was split open causing the spill. There was approx. 30 gallons of diesel fuel on the roadway (Chrisphalt Drive). No injuries reported. Provided spill control and containment. Dumpster Fire on Nor-Bath Blvd. On Monday, April 9 - Dispatched for dumpster fire. Upon arrival found 6 by 6 dumpster smoking. Used 1 inch line to extinguish fire. Assisted by Station 45. On Monday, April 9 - Dispatched as Motor Vehicle Accident with unknown injuries. Updated to vehicle into house and vehicle on fire. Requested County put Stations 15 and 40 on standby. Updated by TEAMS to vehicle on fire but not into house. Upon arrival there was a Jeep in the yard of a home on Airport Rd. fully involved and a Hyundai on the roadside. There was a driver only in each vehicle. Both were out of the vehicles. Fire units from Station 46 stretched a 1¾ inch hand line to extinguish fire, assisted by Station 45. Fire was extinguished without incident. On Friday, March 30 - Josh Smith placed third at a state competition of firefighting skills at the Schnecksville Fire Co. and won a BRONZE METAL. He placed first at a local district competition of firefighting skills at the Bethlehem Twp. Fire Co. and won a GOLD METAL. This was a program provided by the Bethlehem-Northampton Area Vo-tech School. On Saturday March 10, the members of EAFD, said Good-bye 1986 Mack MS after 16 years of service. Later this year we will be taking delivery of a replacement unit. Brush 4647 is getting an electrical system upgrade. Much of the original wiring is being replaced due to age and the lighting is being brought up to current standards. All the work is being done in-house. A group of 12 members of EAFD recently completed the 24-hour NIMS-300 training program. This is the first such program in Northampton County. Those completing the program included Assistant Chief Ray Anthony, Captain Lee Boehning, Jr., Fire Chief Barry Frantz, Firefighter Sean Frantz, Firefighter EMT Julie Hamilton, Firefighter Donnie Hunter, Deputy Chief Brett Kresh, Fire Police Lieut. Gary Maursky, Fire Marshal John McDevitt, Fire Police Captain Carl Schafer, Junior Firefighter Josh Smith and Fire Captain Marc Wisniewski. The course was taught by Chris Post, Dave Swoyer and Tom Barnowski.